Sorry about not posting the "after" for so long! 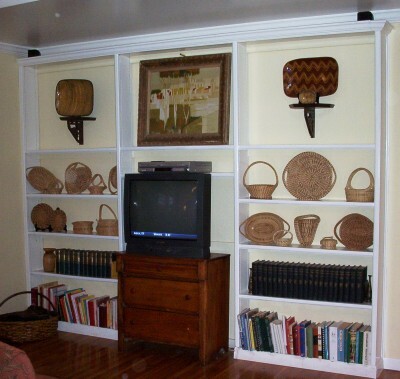 It's not a dramatic difference from the bookcase's earlier condition, but I was able to shuffle and edit our books. There is a bit more breathing room for resale, and the wires have been tucked away. A quick fix with no cost to me. Wait--I did break the picture light trying to screw it to the back of the painting's frame. Add another to the yard sale wish list! 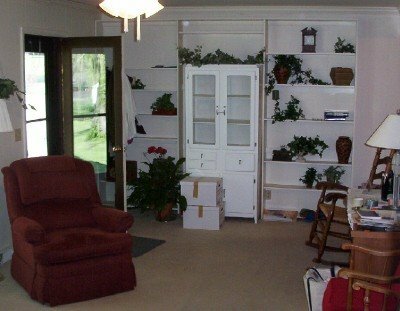 Update: I found a photo of the bookcase as it looked when we bought the house. We beefed up the molding and added contrasting paint to the back of the shelves for more impact. Maybe not a dramatic difference, but a dramatically different first impression. It's amazing what a difference small changes can make.